2go Travel Promo 2017: The company 2Go Travel or formerly Superferry has released a one-day promo during Mother's day but you don't need to worry as the said promo is still can applicable to this very day! The 2go Travel promo will have a travel period from June 16 to September 30, 2017. There are various routes in which 2Go Travel is sailing. From port to port ferries. Routes are to and from MANILA, BACOLOD, BATANGAS, BUTUAN, CATICLAN, CEBU, DUMAGUETE, ILIGAN, ILOILO, OZAMIZ, PALAWAN, ROMBLON, ROXAS and other inter-island destinations. When purchasing a 2Go promo ticket, you are expected for a FREE onboard meal and a FREE personal baggage allowance up to 75 kg. 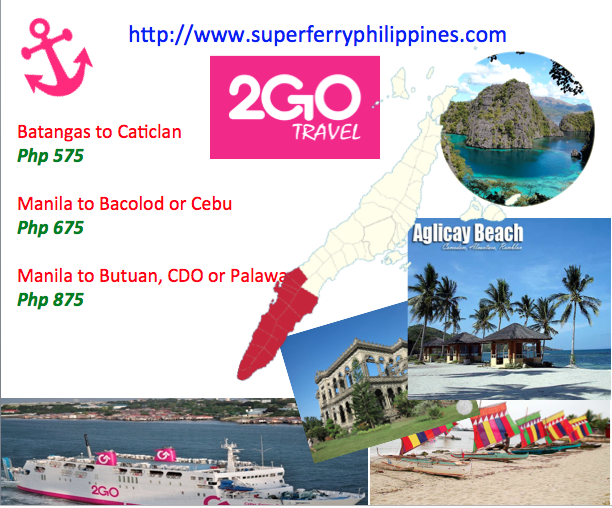 Superferry regular priced tickets can be purchased from the various authorized ticketing outlets of 2go Travel. For superferry promo fares, it can be availed when you do bookings online thru 2go travels website. For more inquiries, it's best to contact them here: (02) 528 7000. During boarding with 2go Travel, make sure to present a valid ID along with your eTicket, a photocopy of the credit card used when booking the ticket. A necessary authorization letter from the original card holder of the credit card it the owner is a different person. Manila to davao? sakop din ba ng 875? Pede pa ba mag avail ng promo from manila to P.P.C ? At kung pede pa maka sakay ang turning 8mons preggy this september. May promo b kyo ngyon manila to butuan ngyong buwan? may promo po ba ngayon cebu to manila? Cebu to manila po merun po ba? Good dAy, manila-davao mgkano po december 15. Magkano po from Manila to Dumaguete ngyong April 1? Good day magkano po papuntang dipolog feb 1 2019? Good afternoon how much poh papuntang dipolog january 2019?? Manila to pagadian how much po?